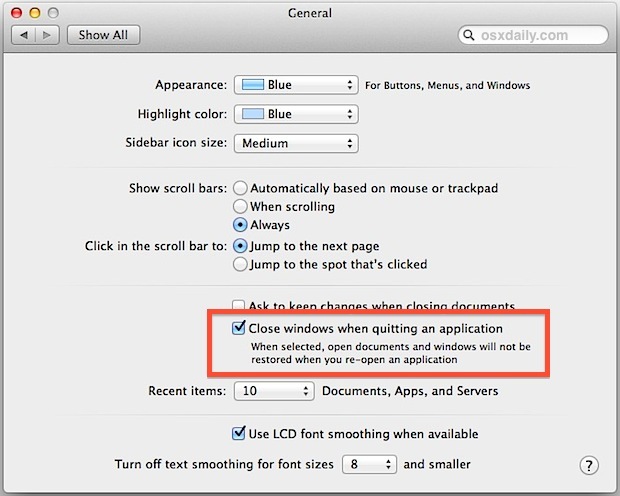 Mac OS X defaults to automatically re-opening windows when an application is quit and relaunched later. This feature is borrowed from iOS and it’s incredibly useful, and once you become dependent on it you’ll find that it can really increase your productivity by allowing you to get back to work quickly. This is especially true when you need to quit out of an app or ten to free up resources for another task, or just to help maintain focus and stay productive when too much is going on. Outside of it’s obvious usefulness, the Window Restore feature was divise when it first came to the Mac, and it continues to divide a lot of people. There are plenty of situations when you don’t want to relaunch previously opened documents and windows, particularly when sensitive or private data was being accessed, or for when Macs that are shared with multiple users or even uses (unsolicited advice: setting up unique user accounts is an infinitely better solution for multi-user and multi-use Macs). In these cases, there are two ways to handle window restoration: turning it off temporarily on a per-app-quit basis – the recommended approach – or just disabling the feature completely – which is less recommended for reasons we will discuss. Let’s cover both options. Be sure to have Auto-Save enabled if you’re going to use this feature, otherwise it’s remarkably easy to lose important changes to documents, especially if you’ve become accustomed to relying on autosave. 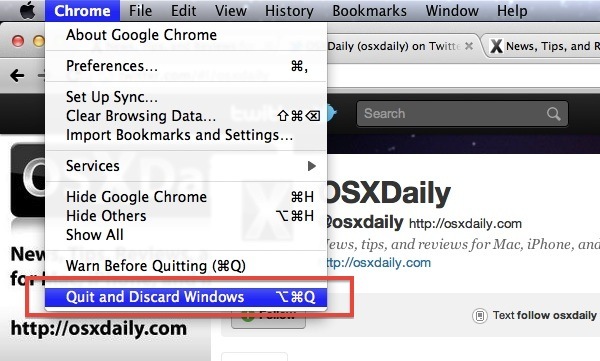 This discarding trick has been around for a while, and it can apply selectively to every single Mac application. The description is fairly explanatory “When selected, open documents and windows will not be restored when you re-open an application”. This ends up with apps behaving less like iOS, and more like older versions of Mac OS X and Windows, which may be good or bad depending on your opinion of document restoration and whether or not you enjoy hunting around for things in the file system. Apple enables this feature by default in OS X and iOS because they have determined it’s much more helpful to be able to immediately resume things where you left off than to go hunting-and-pecking through files to get back to what you were doing, and I tend to agree with them, leaving this feature turned ON ultimately saves time. Note the above instructions are specific to OS X 10.8 and newer. 10.7 only uses a slightly different approach and the setting is called “Restore windows” instead. 10.8+ ultimately handles this behavior much better and it is highly recommended to upgrade from 10.7. Again, if you decide to automatically close all windows and disable the window restoration ability, it is highly recommended to leave auto-saving enabled universally, or to turn it back on if you happened to have disabled it at some point. Auto-saving is incredibly beneficial and will prevent you from losing changes to documents, which is even more important when documents are no longer automatically re-opened. Note that if you do decide to always close open windows, the originally recommended “Option+Quit” trick becomes reversed. So rather than discarding windows, using Command+Option+Q selectively enables window restore on a per-quit basis.